Spring is finally here! *knock on wood* While cruising around my local farm stand, Wilson Farm, I spotted the freshest looking asparagus I had ever seen! All of the fruit and vegetables here are amazing. Still a little on my soup kick, I knew exactly what I wanted to do with it. 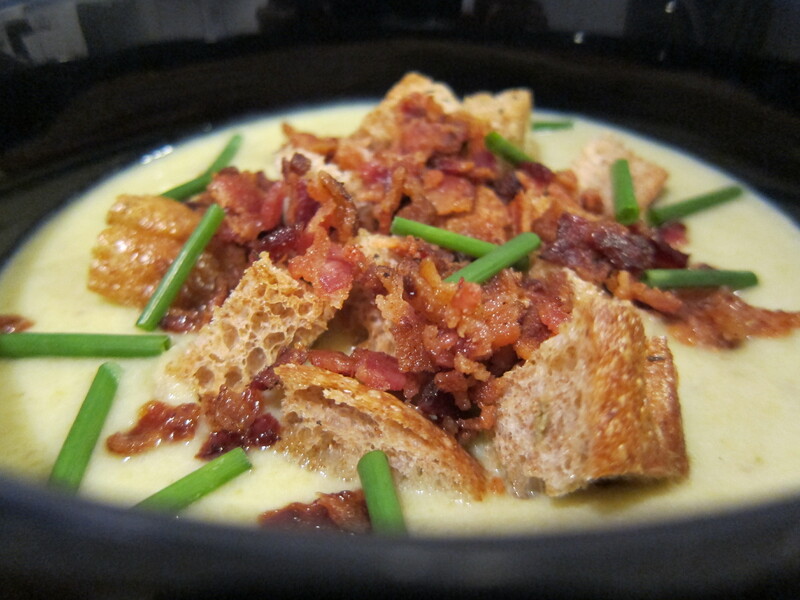 Adding bacon to the soup is definitely the way to go. I love how the smokiness of the bacon cuts into the healthy taste of asparagus haha. Melt butter in a medium pot over medium low heat. Add onions and garlic until onions are tender and garlic is fragrant, 5-7 min. Add in broth and potatoes and bring to a boil. Reduce heat back to medium low, add in asparagus and simmer until potatoes are tender, about 20 min. Remove from heat and cool slightly. While the soup is cooling you have the perfect amount of time to make the croutons. Preheat oven to 350F. Spray large baking sheet with cooking spray. Toss all the ingredients together in a large bowl and then spread out on the baking sheet. Bake until golden brown and crisp, 10-15 min. The soup should be cool enough to puree now. Add in the tofu. Using an immersion blender (can also use a regular blender if done in batches) puree the vegetables in broth until smooth. On medium high heat bring soup back to a boil. Soup is done! Ladle the soup into 4 bowls and divide the croutons among them. Crumble 2 slices of bacon over each. As a final touch sprinkle the chives on top.